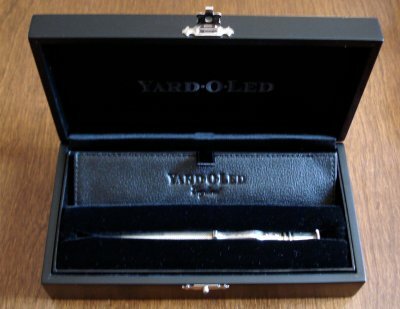 Yard-O-Led is a famous writing implement manufacturer. For those who appreciate graphite writing implements, their products have a unique appeal. The company’s original offering, the mechanical pencil, is still made in historic styles and formats by a team of six in Birmingham, England. Unlike many other fine writing implement manufacturers, their pencils are not derivatives of a pen offering – the pencils have a unique mechanism and format which has remained essentially unchanged from 1934 to the present. This particular pencil was chosen carefully. Though other traditional formats appealed to me, my experience with a vintage Yard-O-Led pencil indicated that some were a bit hard to hold in my hand. I wanted this pencil for daily use, and not to be banished to a shelf. For me, the Edwardian pencil got it right – round, heavy, with a long tapering that allows for a wide variety of comfortable grips. The weight is 45 grams! Consider that a modern woodcase pencil is about 4g, and a large modern metal pencil like the Porsche Design P’3120 is 30g – the Edwardian is a substantial heavyweight. Yet the weight is nicely balanced, and the 134mm long pencil is comfortable to hold. The body is sterling silver, with a barleycorn pattern finish. The nose has a very long taper. There is a clip with serial number and the “Yard-O-Led” name. The flat top cap is marked “Made in England”. The barleycorn has two interruptions – a space for hallmarks, and a space suitable for engraving. The cap twists to extend and retract the 1.18mm lead. An advantage of the twist mechanism is the ability to retract the lead. The lead refill mechanism is much smoother and more usable than on the vintage pencil, which should not be a surprise. The instruction booklet is still welcome – it isn’t a typical refill system for 2009. I have been using the pencil at work for about one month. While one month is not a long period of time for a pencil that truly was made to last for years, I’ll say that I am absolutely delighted with it. It writes, looks, and feels like something special – which it is. The pencil is not inexpensive, yet I have no trouble saying it is definitely worth the price. In fact I regret having purchased so many cheaper mechanical pencils the last few years (especially those aimed purely at drafting purposes) – most are now stashed away unused in drawers, and cost in aggregate much more than this Yard-O-Led. 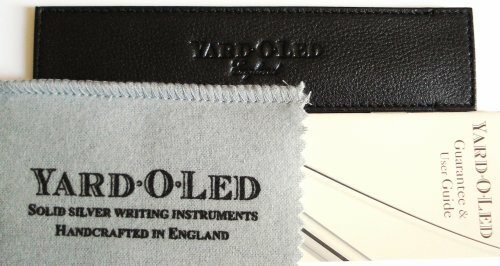 The guarantee states that Yard-O-Led pencils with serial numbers will always be serviced, and there is ample testimony around that the manufacturer faithfully honours this statement. It will not be my last Yard-O-Led! Pentrace article on the history of Yard-O-Led. Previous post at pencil talk on a vintage Yard-O-Led pencil. That post was privileged to receive a comment from Mr. Colin Keates, the grandson of Yard-O-Led founder Ludwig Brenner. Very interesting. I didn’t know that this style was still being made. I’ve got a nice gold filled Wahl Co. Eversharp (USA made). It was meant to be personalized, and mine is engraved with “Robert Beck”. It has a “meanderline” pattern on the barrel with taper slightly longer than a sharpened wood pencil. It’s a very nice looking mechanical pencil and feels great. 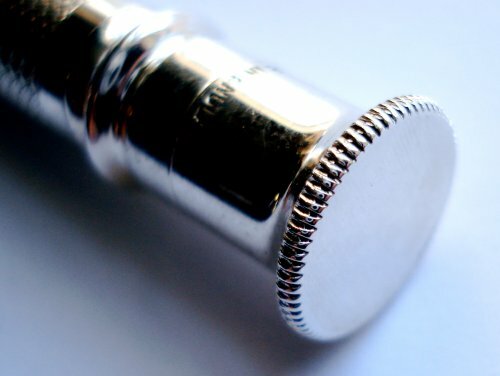 The pocket clip is very short, which was the style before the mid-1900’s. I think I got it from one of the pen/pencil collector sites. The bulk of my mechanical pencil collection is from ebay. Does it still hold 36 inches of refill leads? Sadly I am in Dave’s predicament over budgets and I would be terrified of losing such an item. Wow, that is a beautiful pencil and, yes, I’m envious. You also make an excellent point of buying the right pencil the first time instead of a hundred OK pencils. Perhaps this blog and Dave’s can help first time buyers pick the right pencil the first time. For myself, the weight worries me. I like my pencils to look fantastic and then to “fade from view” while I draw or write. I’m not sure that would ever happen with me at 45 g; although , it looks like the weight is a bit higher up on the YOL so it shouldn’t be a problem. I have a sterling Caran d’Ache which I generally love but occasionally, when drawing, it feels like a rock. David O., thank you for the comments. Kiwi-d, on pricing, one has to keep in mind that there are discounters, especially in the US and Malaysia. Merchants in the UK and Canada seem to have sworn allegiance to charging at least full retail price. Matthias, thanks for your comments and for those links. I know information like that existed, but it is very nice to have those links together. I am glad to learn that the ‘k’ indicates this is a pencil manufactured in 2009.
che pablo, thank you for your comment. You raise a number of excellent points. I agree with you on the pencil pricing (however kiwi also made a good point with the vanishing budget)… I have collected some used YOLs via ebay; although I like the look of them and although I can live with the somewhat archaic refilling procedure, they rest mostly in the shelf. That’s because I didn’t get used to the 1.18mm lead, it’s just too thick for me to write with. A beauty! Does the pencil feel very long? And, a strange question, does the barrel get cold in the hands from being pure metal? How does this pencil compare to a Graf von Faber-Castell Pernambuco mechanical pencil, if you have one? Too many questions! In short: congratulations on this stunning purchase. @2nd_astronaut: When you are walking around with several hundreds dollars worth of pencil in your pocket, it might be useful to have a stiletto. :-) Also, I think of 1.18 mm as a drawing lead that hits a sweet spot between 0.9mm and 2mm lead. Like the 2mm lead, you can control the quality of the line but, like the 0.9 mm lead, you do not need to sharpen it. 2nd_astronaut, thanks for your comment. For me, the 1.18mm lead is just fine – I like the fact that it is the unaltered historic diameter, and that the lead doesn’t break. There are new 1.18mm pencils still being introduced to the market, and the Yard-O-Led brand is still around, so some must like it. Adair, I’m not sure if it feels long, but the weight is perhaps more the factor that requires adjustment. I would say it warms in one’s hand over a period several minutes. I haven’t tried it outdoors though, and probably won’t during winter. And alas, I do not have a Graf von Faber-Castell Pernambuco mechanical pencil. If I ever bought one of the Classic line, I think it would also be a silver pencil. che pablo, the lead advance, like the pencil, seems extremely solid to me. No wiggle. On the lead diameters: When I bought my first 1.18 pencil (an old Montblanc Pix), I was interested to see how I like the thicker lead. I expected that it would be fine, since this seems to be the standard diameter for a long time. But — it does’t work for me. Sketching might be fine, but I don’t sketch that much — for writing I clearly prefer smaller diameters like 0.5 (for making notes in books I normally use a 0.9mm, because often the paper is too weak for 0.5). It’s clearly a matter of taste and writing style, I have a small script, so I use thin leads… Also I don’t use much pressure while writing — I don’t remember breaking a .5 lead while writing. Thanks for a nice review and congratulations with a historic and luxurious pencil. It is a wonderful item and the pictures are, well, exquisite. However, I think this review saved me a lot of money. I’ve always wanted one of these, but I have never taken the weight in consideration. I’ve found that I prefer lightweight and no metal – tapering grip zones for a comfortable hold (I have to write much).I think my limit is ca. 35 grams, so this one would probably give me some problems. Well, I’ll just have to enjoy the pictures and think of all the money I’ve saved. A fine instrument with a long history. Brilliant pictures of this exquisitely crafted pencil. I’m researching writing instruments as used and written about by famous authors. 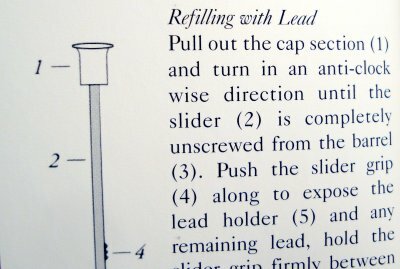 Has the Yard-o-lead being used by any such to anyone’s knowledge? I use an old YOL silver mechanical pencil cerca 1940 which I found among my late father’s pencil collection which I inherited. 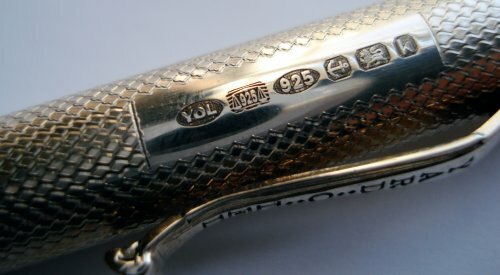 There are several other silver pens on fob chains and one Victorian gold and gutta percha ‘push and pull’ extending pencil as well as a few art deco bakelites. The YOL is very neat and elegant and I love it. The only problem I had was where on earth it could store the yard of lead, until I found the lead reservoir when cleaning the mechanism. Incidentally, I am an author although I doubt the nomenclature ‘famous’. I write of true crime investigations and can be found on amazon.co.uk. Yard-O-Led would kill me for screwing around with their pencil. I bought my pencil because of its feel, balance and elegance. I didn’t buy it as an investment, but as a daily working tool. I’m an artist and use it to sketch and do finished drawings… very delicate drawings where feel and balance were a premium, so I must say, I absolutely love my YOL. Try as I might, I couldn’t get used to the thick lead, nor did I like going to a specialty pen shop to get the leads. Where there’s a will, there’s a way. I gessoed the tip with acrylic gesso. Then I put a .9mm lead in the casing and crimped it to size. I ran it through the wet gesso, retracted it and let the gesso set. I’ve since used it on a daily basis for over fifteen years. I apologize to YOL for bastardizing their fine implement, but it was expensive and I had to make it work for me. It is my favorite pencil of all the Parkers and Pelikans in my collection. I’ve only just discovered this blog and have really enjoyed reading about the YOL experiences of others. I’m an artist and illustrator who draws daily for long hours. I have many pencils of all sizes, prices and descriptions in my collection. But it is my YOL Diplomat which I bought 17 years ago that I am never without. I draw with it daily and write with it extensively. It’s with me when I’m teaching. It sits on my bedside table at night. My children have been instructed to bury it with me! I took it to the Faroe Islands to draw with (where it was VERY, VERY cold). And I took it to Vietnam to draw with (where it was VERY, VERY hot). I too found the 1.18mm leads to not suit me. The softest available (B grade) is too pale for me. So like tomb, I also crimped the holder closed around a .9mm lead when I first bought the pencil 17 years ago and have been happily drawing with it using .9 leads ever since. Sadly now the inner mechanism has become worn out and I’m thinking of replacing it with a Deco 33. If anyone who owns one has some thought on the Deco 33 (positive or negative) I’d love to hear them. Cheers. I have a Vintage Yard O Lette 9ct. Solid Gold Pencil. It is square in shape i.e. has 4 edges tapering towards the writing end. The other end is completely square. It is stamped ‘Yard O Lette’ and ‘9ct.’ Can anyone tell me anything about this pencil? I have seen hexagonal ones but not a 4 sided one like this. 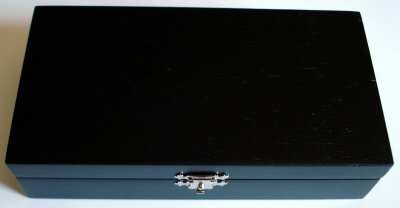 It was a gift that I have kept for 15 years but I never use it, it still has some spare leads, it’s a waste really so I am thinking of selling it and would like to know the value of this unique piece. Thanks for any comments. Hi Anita. It should be stamped Yard-O-Led (not Yard-O-Lette). It sounds like a Deco34 if it’s a genuine Yard-O-Led. My sons have just bought me one in silver. New, in Australia they cost $650. In the US: $375US, in the UK approx 400pounds. They are still readily available new although I wasn’t aware of them being made in gold. Thay may have been but are not in the current catalogue. Contact the factory in Birmingham UK and they’ll be able to tell you more. I have found them very helpful. No, it should be stamped Yard O Lette. They are the smaller version of the pencils produced for a few years in the past. They were designed to be pocket versions. As a vintage pencil their value is nowhere comparable to that listed in the comment above mine. If it’s solid gold (and not simply rolled), it should be fully hallmarked. Fully hallmarked, it’s probably worth about £100 – though the prices fluctuate almost weekly depending on interest. If it’s not fully hallmarked, it’s probably only rolled gold, and so worth about half that. I have not looked at this site for some time but here is a catchup on recent questions. Scribbler’s question on the Deco 33: Still available it is a copy of the pre ww2 square pencil but it is larger, heavier and I find it a little unbalanced to write with. If it is the writing your after I’d favour a second hand pencil in good condition, and you particularly like that style of pencil. They turn up from time to time on auction sites and are not as rare as some people would have you believe; also much cheaper. Anita; your pencil is pre ww2, it is made of a sleeve of 9ct gold over a thicker base of brass and I have mentioned it in an earlier blog. It is however not rolled gold and worth much more than rolled gold. The smaller pencil was made in two versions, the yard-o-lette with a clip was for the “Gentlemans Vest Pocket” ie waistcoat and the Lady Yard – o – lette for the ladies use with a ring which could be attached to a chatelaine. The smaller pencil, with the clip, was produced from the start in 1934 and was still made into the 1960’s. Solid silver and gold pencils were made from 1934 but were always fully hall marked. All silver and gold post war pencils are solid and hall marked. Condition is everything for value of these pencils. The best condition for pre war would be little or no wear (Yes they do exist) , no personalised initials and the original box and instruction sheet. You seem to be no small expert on these matters (as might be expected), and as grateful I am to see these questions answered, I wondered if somewhere there was a comprehensive list of the pencils/pens etc. YOL produced? I occasionally become aware of the most rare varieties, like the Emperor or Topaz, and would love an authoritative study of what the company have made over the years. Kingfisher asked about a list of all the YoL models. Sorry there is no list, but if I finally get my book written there will be. Don’t know if I would be allowed to let you all know when its published on this site. Iwould need to find out. Hi I have a six sided (hexagonal) I think Yard-o-Lette (stamped on the clip)Its in 9.375 gold.Its in a Yard-O-led box so I don’t know if that is original or not.I was hoping you could give me an idea of the age.After the 9.375 mark it has what looks like a small letter b in a circle and then another mark I can’t identify a bit like a cup maybe.It has made in England and JMS Co.The length of the pencil is 122mm Thanks Ian. The YoL ‘yard o lette’ pencil date is 1957 and the letters are JM&Co. Nice to see some comments from Colin Keates. Hello Colin – I am still collecting the odd Yard O Led as I manage to find them, though prices for anything unusual (or even quite common) are getting a bit ridiculous. I have bought some items on eBay at reasonable cost that needed repair, but I have actually found that pencils are cheaper at antique and collectors’ fairs in the North East when they do turn up. If you still have my telephone number, would you give me a call at some convenient time as I would like to pick your brains about an incomplete pencil I was given some time ago – not marked Yard O Led but the mechanism is the same but with a smaller diameter lead tube. If your phone number is still the same I could call you. internal working (which are base metals) and a set of leads weighs 14.7 gms. This would make the gold weight of John’s pencil 8.3 gms of 9ct gold. The price of pure gold as I write is £918 an ounce, troy. The current best scrap price I can get for 9ct is £11.07 per gm, i.e. 8.3gms is £91.91. This may sound both confusing and disappointing but beware if a seller does not realize the high weight of the pencils workings they may well be asking too much. Having said all that the pencil has a value as well to add to the gold value. Hope this will be of use to readers. Hello Colin, I’m afraid that I have mislaid your telephone number, and I should like to know how you are progressing with your anticipated book on Yard O Led pencils etc. I should also l,e to pick your brains about dating of boxes and instruction leaflets. Could you please give me a call at some convenient time: I think that you have my ‘phone number. There is an ansafone if we are not home. I found a Yard-o-lead pencil and can find no image like it.